In a highly unusual move, the House of Commons serjeant-at-arms was sent to the businessman’s hotel and he was given a final warning and a two-hour deadline to comply with the order. In his email to Facebook public policy vice president Richard Allen, which he posted on Twitter on Sunday evening, Mr. Collins said a committee of the House can publish these documents under parliamentary privilege. In an email to Mr. Collins, also shared on Twitter, Mr. Allen said that Six4Three’s case against Facebook was “entirely without merit” and should not be taken at “face value”. Mr. Allan is due to appear before a DCMS committee hearing on Tuesday where details from the documents could be made public. 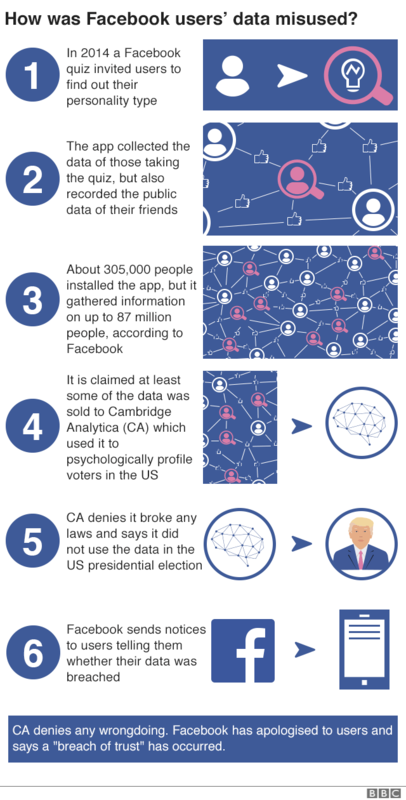 The Cambridge Analytica scandal stems from the discovery that an academic at the University of Cambridge – Dr. Aleksandr Kogan – used a personality quiz to harvest up to 87 million Facebook users’ details. Posted in Uncategorized and tagged #facebook, #investigating, #mcsc, #privacybreach, #TheMessiah.